Thanksgiving is nearly here. In keeping with the spirit of the season, we here at The Pam MacKay Home Team would like to say thank you for your business and referrals. Since our business operates by referral, your continued trust in us drives our team. Thanksgiving is the ideal time to think about what we’re most grateful for; however, our gratitude doesn’t stop there. 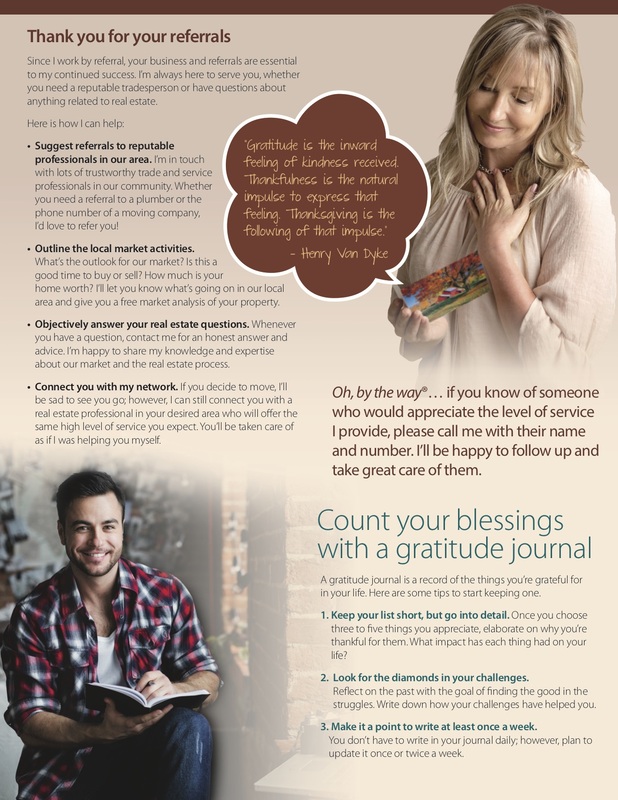 The Item of Value for this month offers tips to improve every day, from keeping a gratitude journal to simply focusing on what you have. It is an ongoing pleasure to serve you and we look forward to helping you meet your real estate needs in the future. Not thinking of buying or selling anytime soon? Take a look at the second page to learn more about the other services we provide. Use the links at the top of this page to share with your family and friends via email or social media! Thank you for all of your past, present, and future referrals. We value our connection with you and your loved ones. Your business and our relationship are truly appreciated.